The Florida Fish and Wildlife Conservation Commission is leading the investigation in the death of Kathleen Miskell, and the piece of equipment that has come under scrutiny is the harness. Thus far, we know that the harness used by Waveblast Watersports, Inc., the parasailing company Kathleen and Stephen Miskell trusted with their lives, failed. The harness in question attached Kathleen to the horizontal bar which was connected to the sail of the chute. The investigation will answer the most crucial questions: Why did the harness fail? Could a simple visual inspection have revealed the cause for the harness to fail? When was the last time Waveblast Watersports inspected the harness, if ever? When was the last time the harness was used? Depending on what FWC finds, new questions could be asked of the harness’ manufacturer. – Two persons must be on the boat when parasailing – The boat operator and a mate. – The vessel must be equipped with a rear-view mirror allowing the boat operator to keep an eye on the chute. 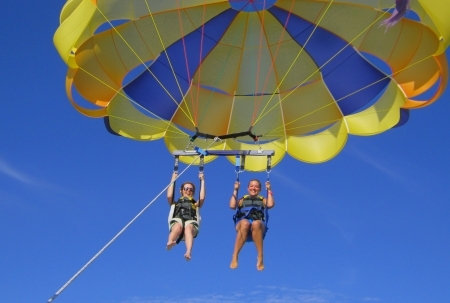 – A parasailing ride can only be performed 30 minutes after sunrise until 30 minutes before sunset. – A parasailing ride must equip its customers with a personal flotation device. Florida law is clearly insufficient and carries no penalty if violated. Even worse, the local, state, or federal authorities have no jurisdiction to conduct any inspections on those vessels. As a result, owners and operators of these parasailing businesses are not deterred by the law to show any due-diligence. On the contrary, shortcuts are taken at every level of the industry, in order to maximize profit margins, to the detriment of safety. The parasailing industry needs strict regulations, standard equipment requirements, and be submitted to regular and surprise inspections. Short of that, we will be mourning the needless loss of many more individuals for years to come.